Boxset consists of cardboard slipcase which contains a 2CD jewel case and slim jewel case. CD1-01 Mixed at Winch. Vocal samples from Pure (2000). CD1-02 Recorded at mixed at Real Noize Studios. Original version on Exile (1997). CD1-03 Recorded at the Doghouse. Mixed at Real Noize. CD1-04 Mixed at Winch. Original available on Sacrifice (1994). CD1-05 Mixed at Winch. Original available on Pure (2000). CD1-06 Recorded and mixed at Todal. Original available on Replicas (1979). CD1-07 Recorded and mixed at Real Noize Studios. Original version on Tubeway Army (1978). CD1-08 Recorded and mixed at Real Noize Studios. Original version on Exile (1997). CD1-09 Recorded in the Bedroom and The Pierce Rooms.Mixed at the Pierce Rooms. Thanks to Meredith Leung and all at The Pierce Rooms for their help. Original version on The Pleasure Principle (1979). CD2-01 Recorded and mixed at Real Noize Studios. CD2-02 Mixed at Winch. Original available on Exile (1997). CD2-03 Recorded and mixed at Real Noize Studios. Original version on Pure (2000). CD2-04 Recorded and mixed at Todal. Original version on Replicas (1979). CD2-05 Recorded and mixed at the Doghouse. Original version on Pure (2000). CD2-06 Recorded and mixed at Real Noize Studios. Original version on Pure (2000). CD2-07 Mixed at Alien Studios. Original available on Telekon (1980). CD2-08 Recorded and mixed at Real Noize Studios. Original version on Replicas (1979). CD2-09 Recorded and mixed at Alien Studios. Original version on The Pleasure Principle (1979). CD2-10 Mixed at Winch. Original available on Replicas (1979). Track CD1-01 Published by Numan Music Ltd / Copyright Control. Track CD1-02, CD1-04, CD1-05, CD1-08, CD2-02, CD2-03, CD2-05 to CD2-07 published by Numan Music Ltd.
Track CD1-03 published by Manufactured / Copyright Control Numan Music. Track CD1-06, CD1-07, CD1-09, CD2-04, CD2-08 to CD2-10 published by Momentum Music Ltd / Universal Music. 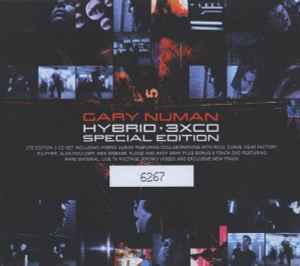 Track CD2-01 published by Numan Music Ltd / Universal Music. Tracks CD1-01, CD1-03, CD1-06, CD1-07, CD1-09 to CD2-02, CD2-04, CD2-07 to CD2-10 Licensed courtesy of Jagged Halo / Artful Records. Tracks CD1-02, CD1-04, CD1-05, CD1-08, CD2-03, CD2-05, CD2-06 Licensed courtesy of Eagle Records. CD1 and CD2 mastered at Abbey Road. (P) 2003 Artful Records (C) 2003 Artful Records. Distributed by The Universal Music Organisation and Fullfill.